Second, you have to go check out all her photos of this outdoor space. Have to. 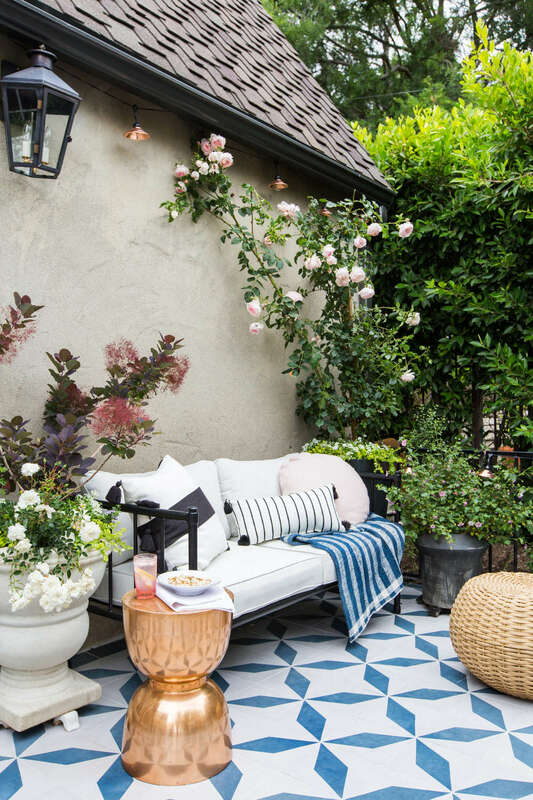 Aside from the fact that the pillows, ottoman, rugs and a accessories would make me want to live outdoors all the time, check out that pink pot wall garden! Remember what I said about thinking about the walls in an outdoor room design? This takes a boring fence to a new level! Spruce up your outdoor living space with some curtain rods and easy, breezy drapes to give your patio some privacy. 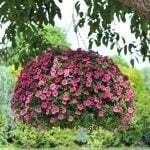 Also, don’t be afraid to bring a vase of flowers into your outdoor rooms too! 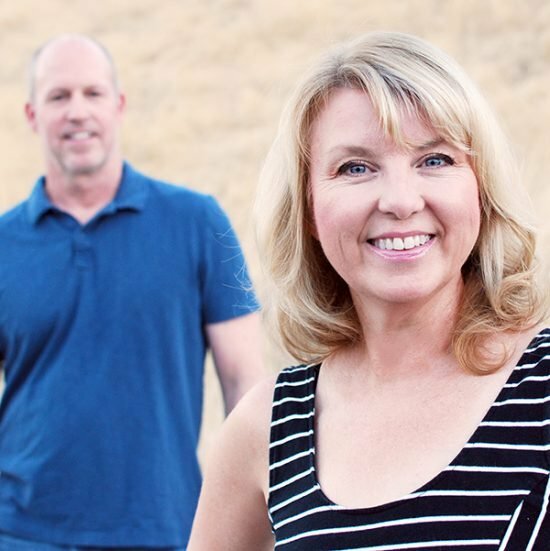 From ‘HGTV‘. 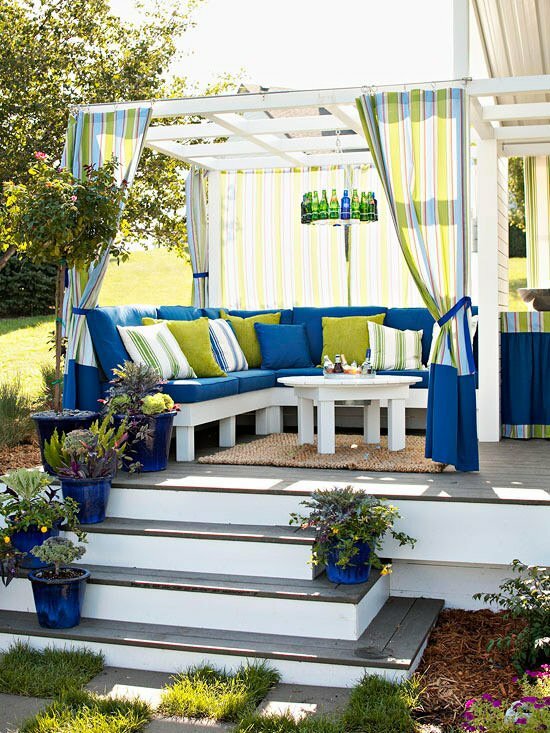 Melissa at ‘Polished Habitat‘ created an outdoor living space that is full of freshness and charm. Her patio is covered, so she was able to use a lot of accessories that you might not ordinarily be able to use outdoors. While you are there stealing (ahem…) all her ideas, make sure to check out that amazing vertical garden raised bed as well! So any of you who have read our blogs for awhile probably know that ‘Emily Henderson’ is one of my fav HGTV hosts. Her style is perfection. Casual, yet lovely. Modern, with a retro twist. Love it. 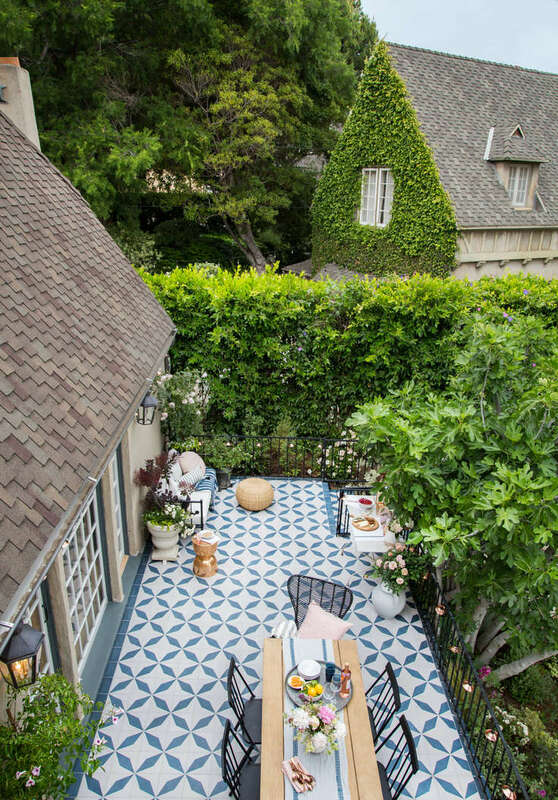 And her outdoor patio is ah-mazing. Like wow. So yes, she has pretty furniture. And yes, she knows how to set a really pretty table. And that sitting area makes me want to grab a book and stay there all day. But that patio floor? Oh, my. Now this is actually laid tile. She originally painted the patio floor with a blue gray floor paint and it looked crazy good, but this tile is out of this world. Can’t afford tile? Pay attention to the next project then. In the meantime, here is Emily Henderson‘s Back Patio Reveal. 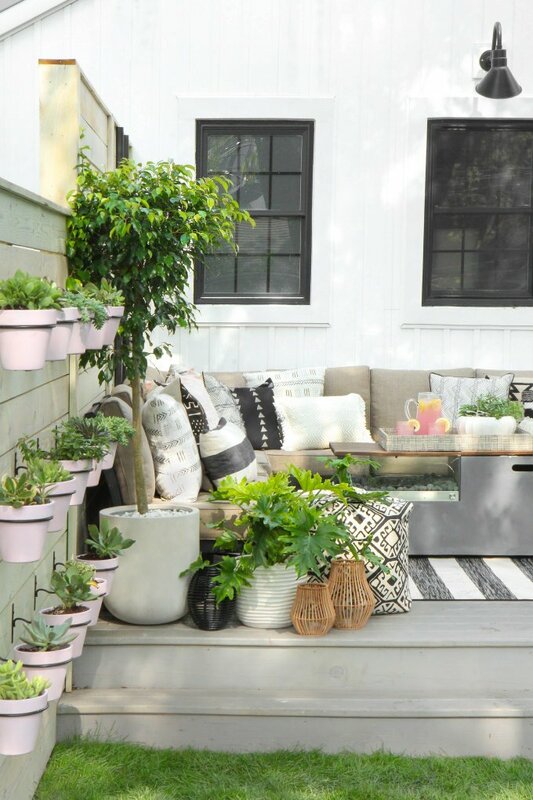 From ‘A Beautiful Mess‘, this is one of the best DIY outdoor patio ideas we have seen. (What an impact!) 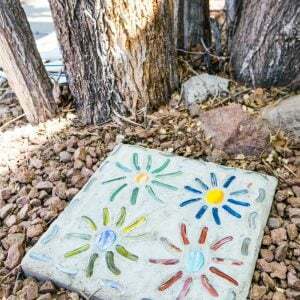 This painted patio tile DIY is the perfect solution if a specialty floor is not in your budget. (Want more? 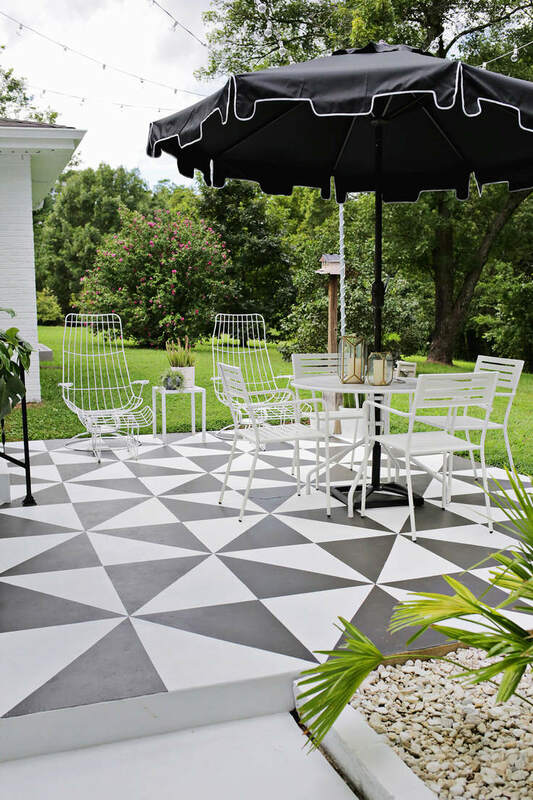 Visit our post on patio flooring ideas!) They have a complete tutorial on how to makeover that boring concrete patio into something that looks like… well, like Emily Henderson’s backyard! Want a little more color? Also from ‘A Beautiful Mess‘ is this painted patio rug tutorial. We also love the outdoor curtains and that succulent chandelier in this outdoor living space! Lot’s of step by step photos and instruction if you want to give this DIY project a try! 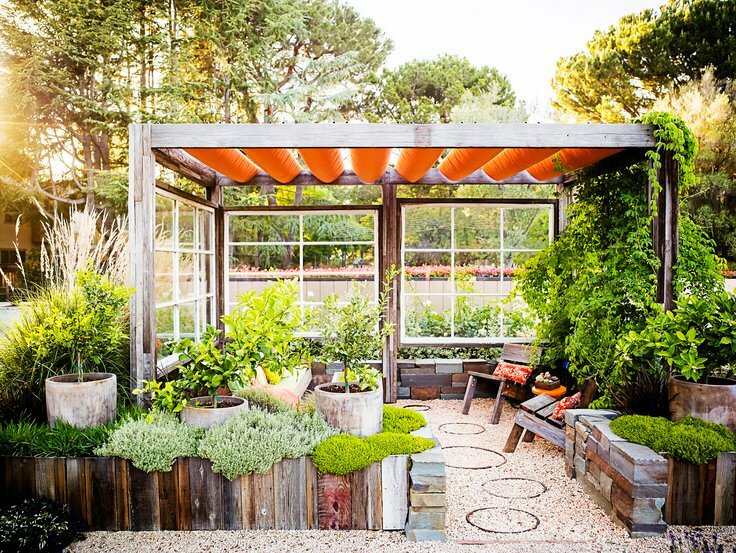 If you are looking for a way to create an outdoor living space from scratch, check out this patio from ‘Sunset‘. 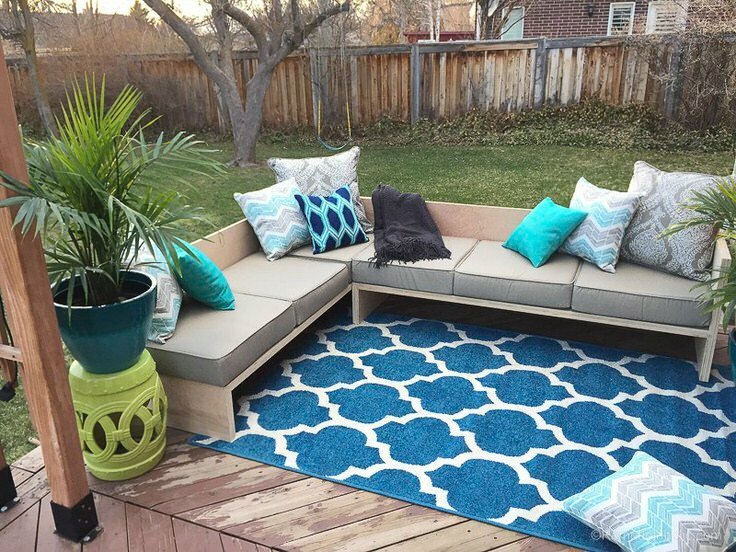 Everything about this outdoor patio can be done by a DIY’er. They built a pergola structure, and then laid a gravel floor. Then they added “walls” with old windows and raised garden beds. 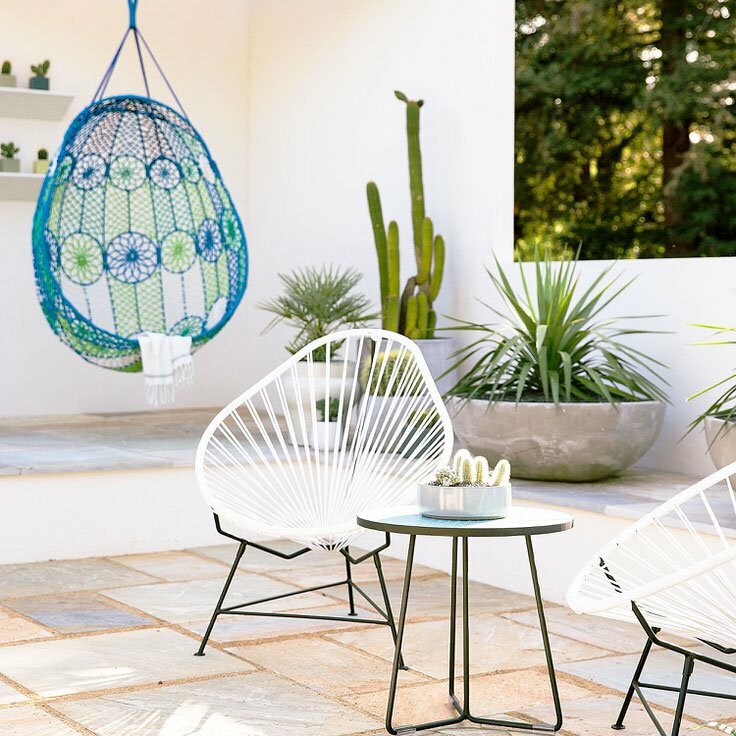 Add a shade overhead, some fragrant plants and a comfortable chair or two, and you have the makings of a perfect place to spend a warm afternoon. Need some help with creating this room? First, go check out their post. 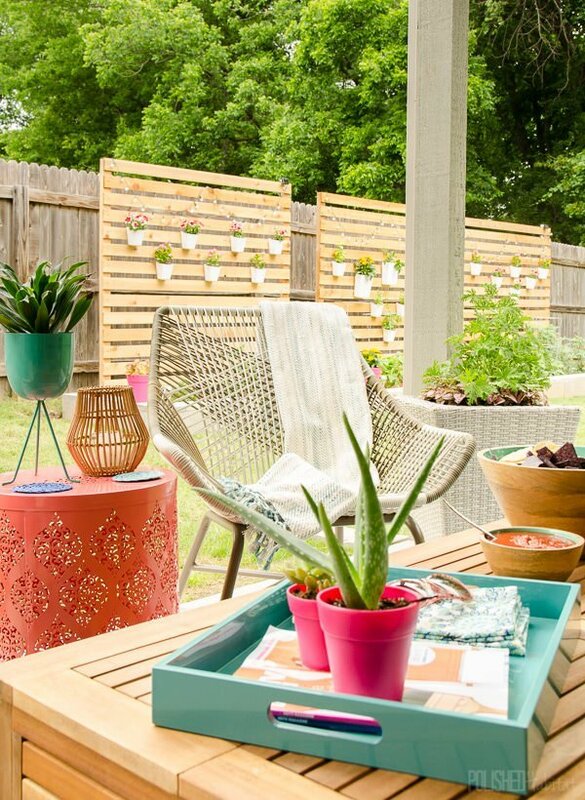 Then, these DIY posts will help you complete every part of this outdoor room! Also from ‘Sunset‘ is this Palm Springs inspired outdoor patio space. We love how minimal this is, yet it exudes high end style. You can’t see it in the photo, but they use a shade sail to protect from the sun. We have post on How to Install Shade Sails that might be helpful! ‘Liz Marie‘ did a farmhouse patio makeover that is calming and fresh. It is simple in design and uses neutral colors. 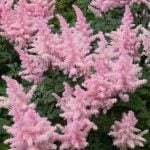 Notice the repeat of the same plant around the exterior of the patio. This gives this outdoor living area a feeling of enclosure without “closing it in”. You could replace the lattice fencing with a simple lattice accent wall or screen to save money. 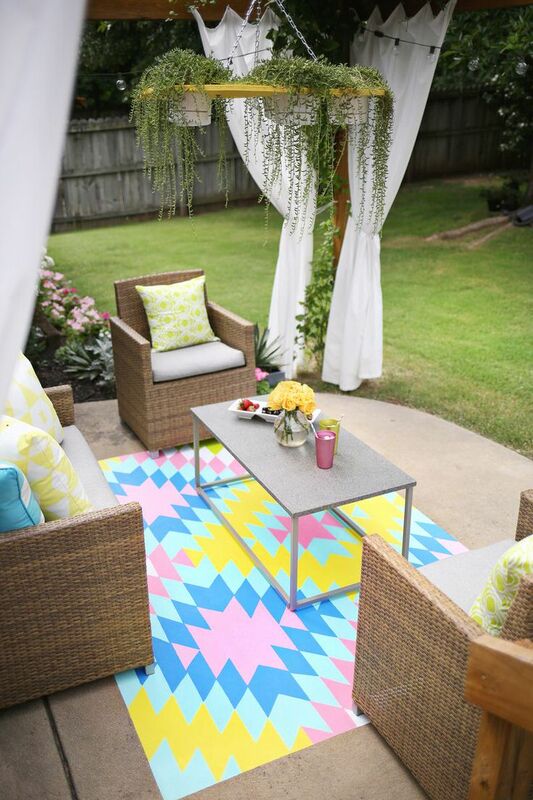 Don’t forget the outdoor rug, not one of the outdoor patio makeovers we have seen have left that out! 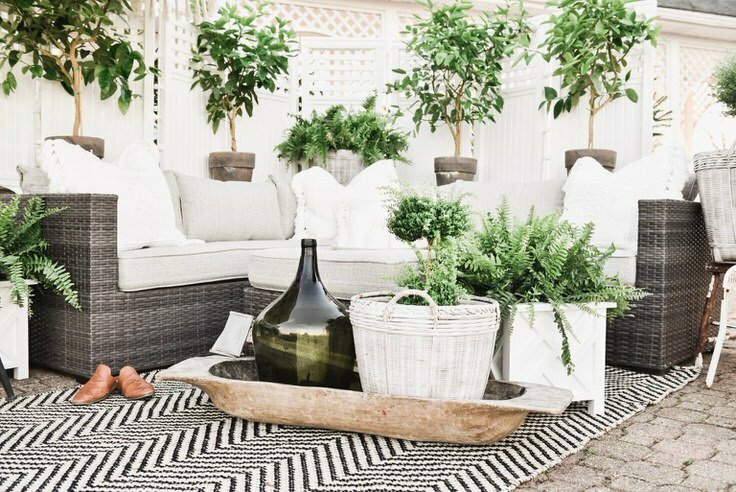 Check out her site, since she has several other patio refresh posts with more vintage styles as well. Need some more outdoor patio ideas and inspiration? 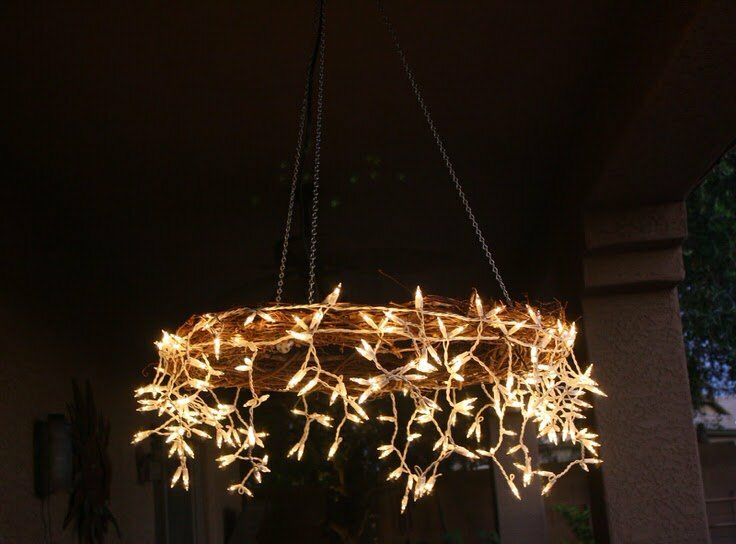 This pretty room from ‘Hayneedle‘ has been pinned thousands of times! 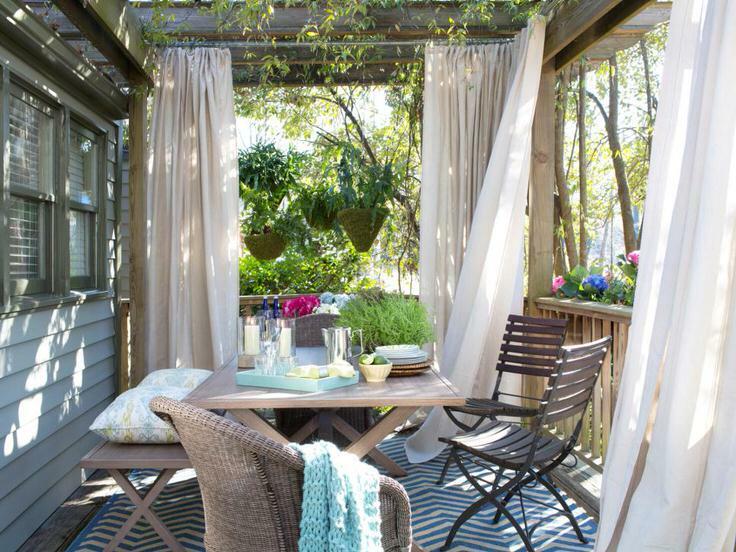 Great backyard patio ideas, in collaboration with Brian Patrick Flynn from ‘HGTV’. One amazing element took this room to a whole other level. 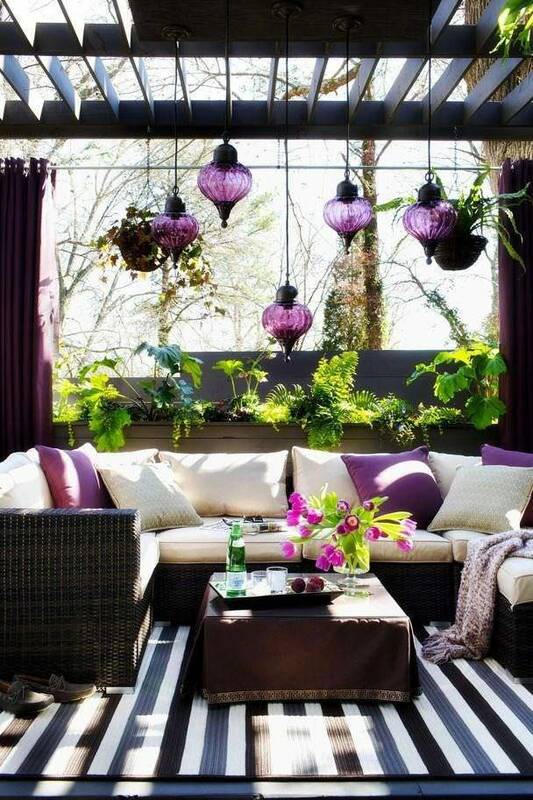 Ok, an amazing color, and an amazing element… the hanging globes! I really hope those light up at night! 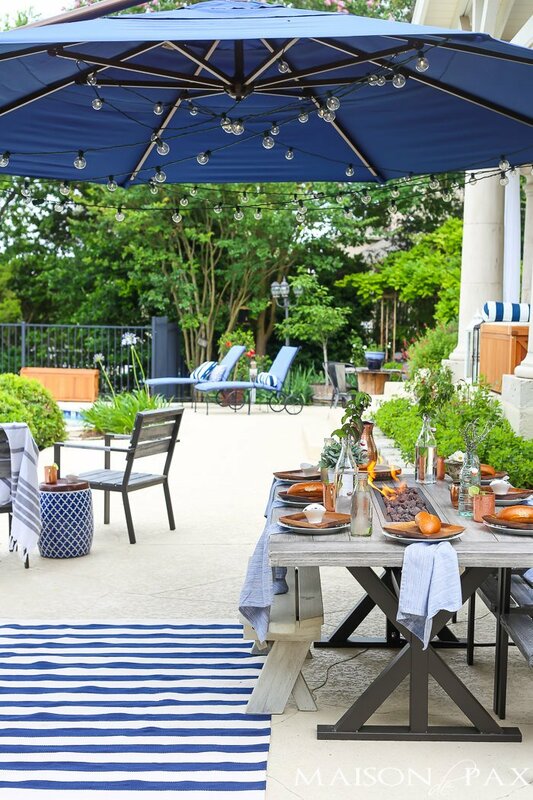 From ‘BHG‘, these outdoor patio ideas reinforce all the tips and tricks we have learned up to this point! Color, comfort and cohesiveness. Just like indoor decorating! So we really loved doing this post on Outdoor Patio Ideas! (We hope you loved it too!) 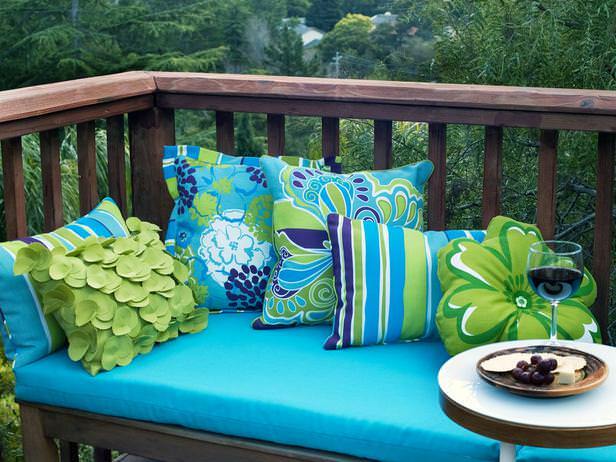 We also think you will want to check out our post on Easy DIY Garden & Patio Furniture! 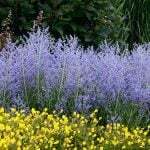 Note: This post has been refreshed with updated ideas and projects. I love the purple room – would love to find those purple pendant lights. I’m sorry Joyce, it isn’t our photo so we can’t tell you! They ARE pretty though! So pretty !! I think i got great ideas for my patio now!! finally i found great inspirational pic after a month. Thanks for the shout-out on my chandelier. Thx for the great project Rainey! These are great, but what do you do when it’s raining? Whatabout the couch cushions and curtains getting wet? 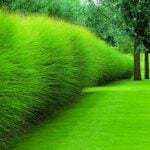 Your DIY outdoor room ideas and tutorial are very inspirational and one should get inspired from your great ideas. Thanks for good sharing.